I’m so honored to be a guest stamper with the Blogging Friends Blog Hop this month! How exciting!! This month, the blog hop theme is Love / Valentine’s Day. My share for the hop is this gorgeous Valentine’s Day card. It combines the Stampin Up Bloomin’ Love stamp set and this month’s Paper Pumpkin kit (Jan 2017). Love these beautiful lace doilies, they are Very Vanilla on one side, and Whisper White on the other. This is the white side. The Sending Love Glassine Sheets was cut with the Lots of Labels die for the subtle background embellishment behind the doily. Some Gold thread and a touch of sewing / stitching really pull this card together. Had some help from my friend Veronica Zalis with this design. The Real Red solid “Love” heart and banners come from this month’s Paper Pumpkin kit (Adoring Arrows Kit). I have more alternate projects, a video tutorial and giveaway for this kit. I’ll post the details below. 151,000,000,000. That’s about how many valentine cards are exchanged each year. Yours will stand out when you make them yourself. This set has the right mix of images and sentiments for all the people in your life, from family and friends to your one-and-only. Paper Pumpkin monthly kits from Stampin’ Up! 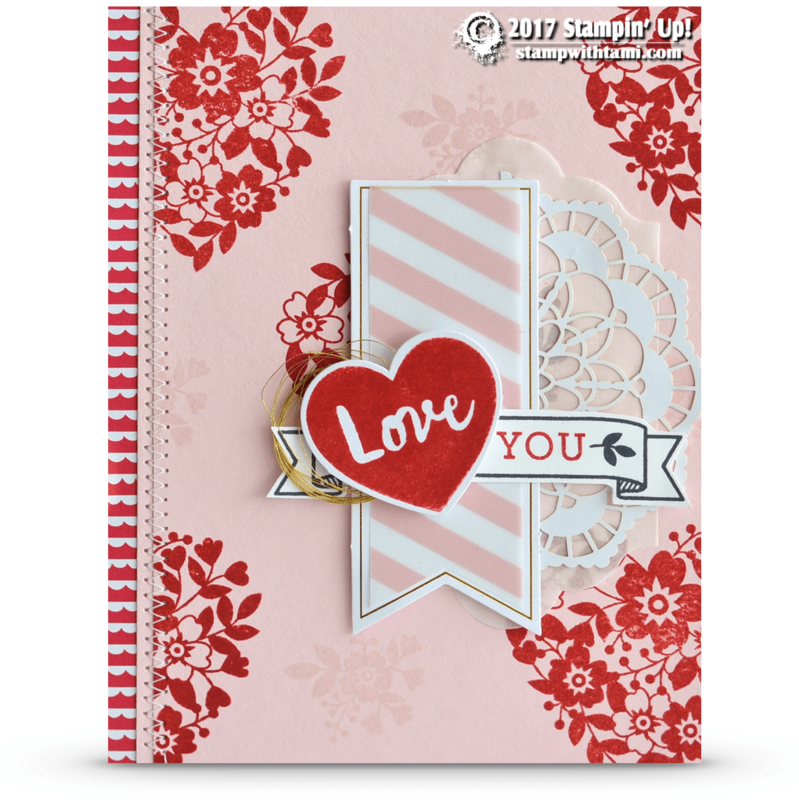 Hi Tami, this is such a fun card and I love how you added in components of your PP kit. Thank you so much for joining in on our blog Hop this month, what an honour to have a $1M achiever!! Beautiful card Tami and I love the stitching! Thanks so much for hopping along with us this month, we are so very happy you could join us! That stamp set is awesome and your card is soooo cute. Thanks for all your good ideas. Awesome and love how you added items from PP kit. I love how you combined the Paper Pumpkin & Bloomin’ Love! Beautiful card! Thank you for joining our hop this month! Great card, Tami! Thanks so, so much for hopping with us this month! I am so stinkin’ Happy to have you on our blog hop today! I have been a long time fan of yours. 😊 I love your use of the Bloomin’ Love stamp set! Love your cards Tami! I too have been a longtime fan. So happy you joined us this month! Such a beautiful card, Tami! So many wonderful details. So glad you could join us on our blog hop this month! Thank you! Blog hop. Hooray! Thanks for the giveaway. Such a beautiful card. I love the lace dollies and I love you can use them on either side:) So happy you were able to join our hop this month!